Every day is a day to give thanks, and I try to do that every night in my evening prayers. But in the U.S. we set aside the fourth Thursday of November as a special day. On this fourth Thursday in 2015, I have so much to be thankful for. 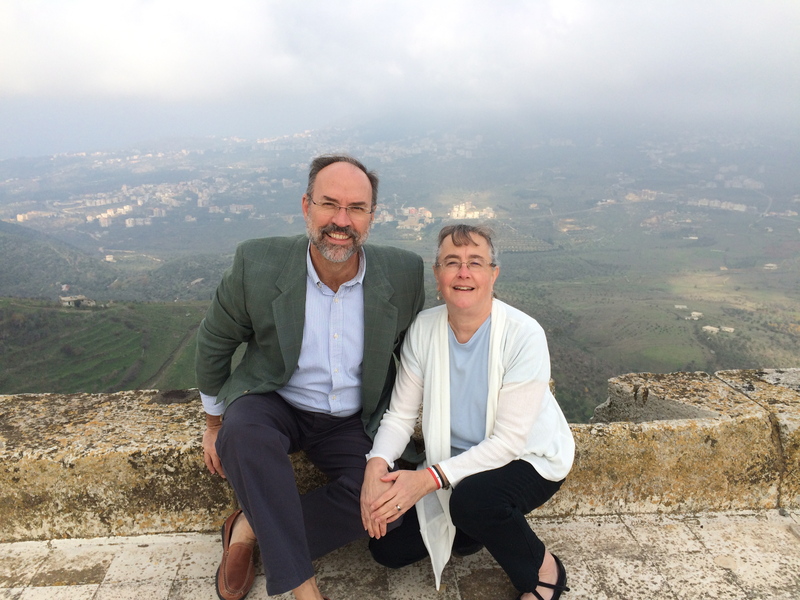 Steve and I on the top of the Krak de Chevaliers, Wadi al Nassara, Syria, November, 2014. First on my list is my husband, Steve, who is standing in the kitchen chopping vegetables for a savory bread dressing, a staple of the meal that goes with this day. I am thankful for the miracle he is in my life; not looking for a life mate, our paths crossed fourteen years ago and here we are today. Sharing life. Sharing love. Sharing joy and sorrow. ‘Til death do us part. 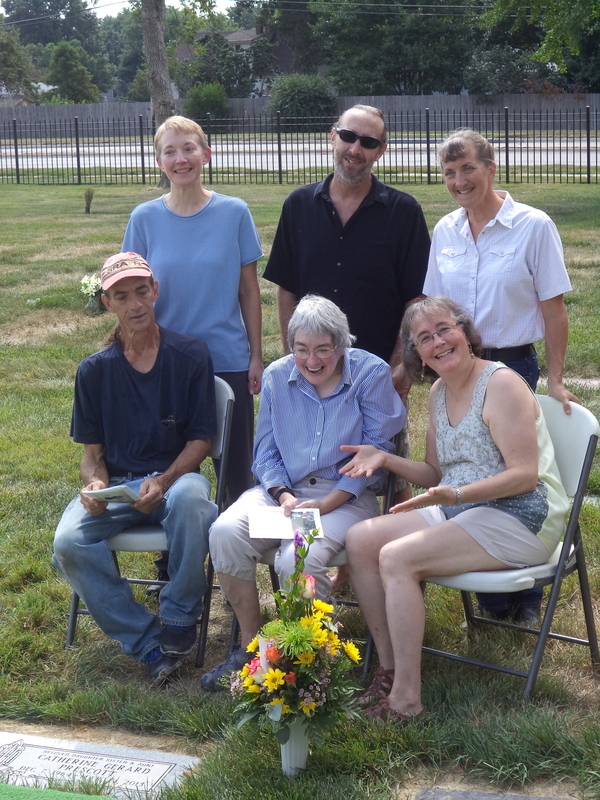 Six siblings at the memorial service for the seventh, our baby sister Cathy.. I am thankful for brothers and sisters who have walked through the hard times of head injury, of broken marriages and of new marriages, of loss through disease and grievous loss through crime. We once were seven, and now we are six, but the six remain a unit bound together through love. We are family. I am thankful for friends who open up the world as a place to experience God’s glory and his grace. They encourage. They grieve for, mourn with, and on the other side they celebrate in joy. They are faithful women. They are lay and clergy – men and womenI am thankful for friends who open up the world as a place to experience God’s glory and his grace. They encourage. They grieve for, mourn with, and on the other side they celebrate in joy. They are faithful women. They are lay and clergy – men and women. They sing. They dance. Their tears flow with mine. Their laughter is a symphony. They will go anywhere. They will do anything. Even when it is so hot the sweat pours off their faces; even when they are drinking their tenth cup of deep, dark, sweet Arabic coffee when they would rather have an iced tea. They will venture to places that cause people to say, “You are so brave!”, even when they know it is not their courage, but the courage of others that draws them into participation in life because they know where real courage comes from. Kirkuk, Iraq, November, 2012, with The Outreach Foundation. The gentleman in the front row, second from the left, is now the patriarch of the Chaldean Catholic Church, His Grace, Louis Raphael Sako. 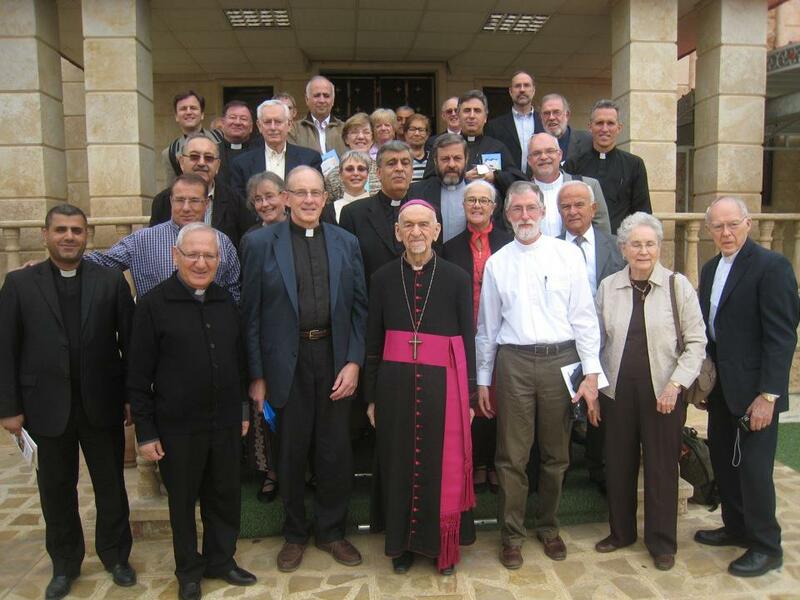 I am thankful for the church I have come to know in Lebanon and Syria and Iraq. I am thankful that when I say I believe in God the Father almighty, and in his son, my savior Jesus Christ, and in the Holy Spirit who is my guide and comfort, that I say it in community with the saints of old and the saints of now. They are embodied in Catholic, Orthodox and Reformed congregations and the faith and courage and perseverance they model every day in the midst of war and terror and death is a reminder to me of what it means to follow this triune God. He does not promise us life without loss, but he does offer us life abundant. And when I see how abundant life is in the church in these hard places, I have seen this promise lived out daily. I am thankful for grace. For I have deserved it not, earned it not, purchased it not. But it has been freely given at great cost. It’s a Saturday morning here in Omaha at West Hills Church. 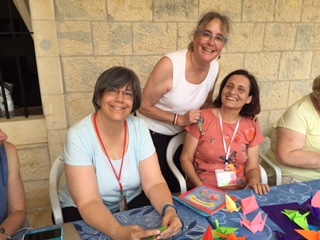 We have welcomed back our dear friend Pam Moore to lead our women’s retreat called “Beautiful Chaos.” It is so good to hear her and see her and be reminded of the gifted speaker and teacher she is. And, oh! How she loves Jesus. That’s why I am here. To see and hear Pam. My Saturdays are precious to me as the other six days of the week I am here at church. I love to sleep in and be lazy and enjoy my sweet Steve. So I am here under duress, but as usual, God had other things in mind! And Pam’s teaching this morning was on the gospel of John in chapter 11 about the raising of Lazarus. It’s a story I have heard and read many times. It is so cool! Jesus raises his friend Lazarus, the brother of Martha and Mary, from the dead. He was dead. In the tomb for four days. And Jesus tells him to come out. And he does. Isn’t that cool?! He was dead and now he is alive. In every movie about this, it’s a pretty dramatic presentation. A DEAD MAN WALKS OUT OF HIS TOMB. Where have you ever seen that except for in the movies? I haven’t. I wanted it for my mom when I was seven. I even prayed so hard! “God, if you can bring your own son back after three days, you can bring my mom back, too.” If I had known the story about Lazarus when I was seven, I would have given him one extra day in my prayer. That was my theology at seven. Today, Pam gave me a completely different perspective on this story and I am so grateful! Jesus loved Lazarus and was grieved at his death. Jesus loved him. Jesus loves us. Jesus loves me. He grieves with Mary and Martha, he grieves with us, he grieves with me. In the bosom of his divine humanity, he grieves at our messes, our losses, our sufferings. He was weeping with snot dripping out of his nose just like me as I prayed that prayer as a seven-year old whose mother was dead. That is the God who walks with me and walks with you. But the other thing that Pam gave me today about this passage which I instantly lit up about was this: He asks us to join him in this setting free. In verse 39 he tells Mary and Martha and the gathered community of mourners, “Take away the stone.” They are to take the covering from the tomb. Jesus is not using his divine power to levitate that heavy plug out of that hole. “Take away the stone.” He wants us in this moment, helping, believing that he can do this. And they do, and out Lazarus comes in that God-blessed, made-for-the-movie moment of a dead man walking out of his grave. Did I mention he had been then for four days? You – community of believers, family of man, church of God – join me in this ministry of healing and freedom and resurrection. Free this man. Come to his side and take away the stinky four-day old graveclothes and help me set him free. That is the calling of the church. That was explained to me in a very profound way today by a woman who has taught me so much about grieving in public in the loss of her husband and my pastor and mentor, George. And she did it with grace and beauty and humor. 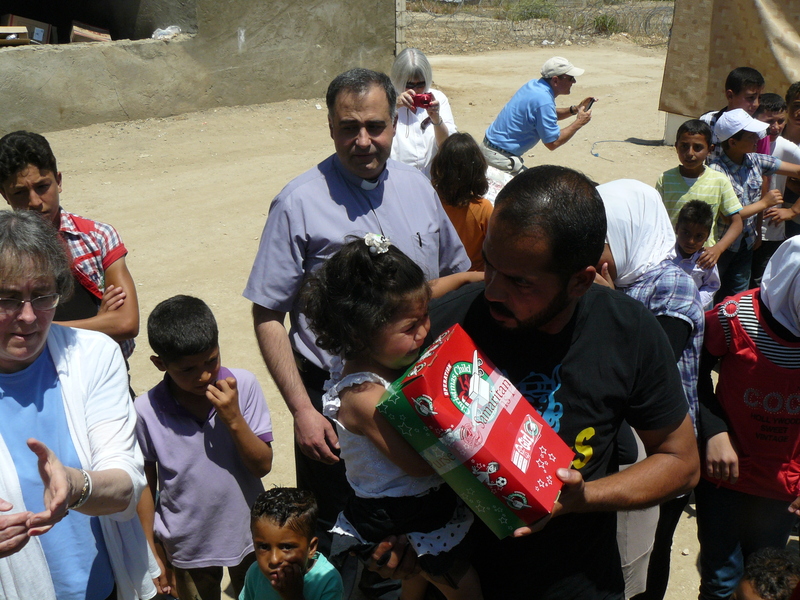 Assis Ramsey from the Presbyterian church in Zahle, Lebanon, ministers to the children in a refugee camp in May, 2013. But then this picture came to my mind: this story is being lived out daily by the church in the Middle East and I have been so privileged to see it from a front row seat. In Syria and Lebanon and Iraq, the people are grieving. Oh my Lord, can you imagine the losses? Their homes are blown apart by mortars. Their sons are marching off to war and dying by the thousands. Their churches and mosques are targets of people who hate them. Then, if they don’t leave their broken homes or convert to an ideology of evil and death, they are murdered on the spot, with a bullet to the head or a knife that severs their heads from their bodies. I cannot imagine the horror they live with, yet I have seen the result. 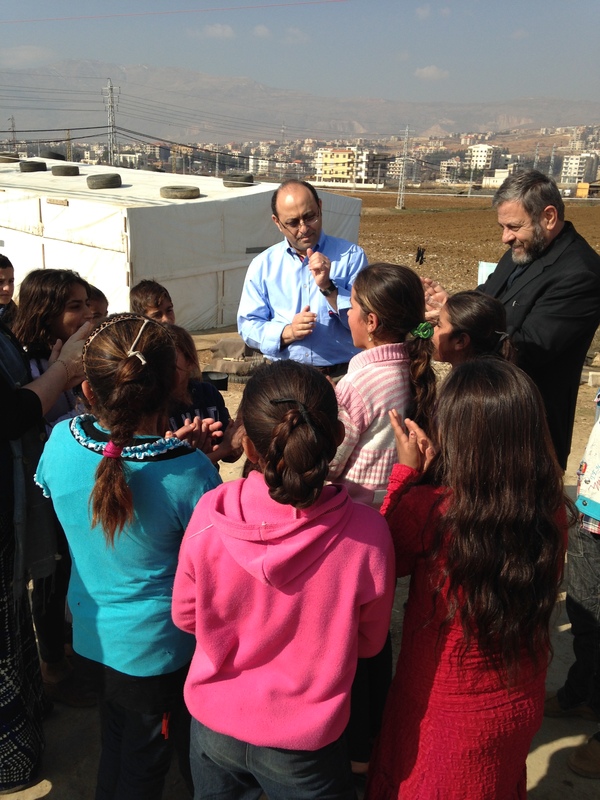 Assis Fadi, moderator of the National Evangelical Synod of Syria and Lebanon encourages the children to sing and dance at an even larger refugee camp near Zahle, Lebanon, in January, 2014. And God is in the midst of their grief and sorrow, weeping with them. How could he not? Roll the stone away. Take off the graveclothes. Find a purpose in your community with me in your midst. And they do all of this. The church that I have been privileged to walk with in the last four years is walking in the refugee camps housing thousands of their neighbors, forced from them homes. They are bringing medicine and food and joy and love and healing. They are opening up their homes and their churches to welcome those forced from their own homes. They are using their own scarce resources to share with those who have nothing left. They are bringing beauty from ashes. They are God’s presence in the chaos of war. And I believe that God can do this. I believe when his community of people come together to move the stones away from the tombs of the oppressed and strip off the graveclothes that bind them to the prisons of refugee camps, showing the love of neighbor to neighbor, that this will bring about a lasting peace, a peace that is not found at the end of a gun or that falls from the sky in the form of laser-guided missiles. God weeps with us. But that is not the end of the story. The end of the story comes when we believe what he says and join together with him to call forth life from death. Let us roll the stone away…together. All-powerful God, we pray that you might send us your Holy Spirit. May that Holy Spirit help us to model a pace of life that strives to keep in step with the movement of the Spirit. May the comfortable be discomforted by Your Spirit. May the afflicted find rest in your Spirit. 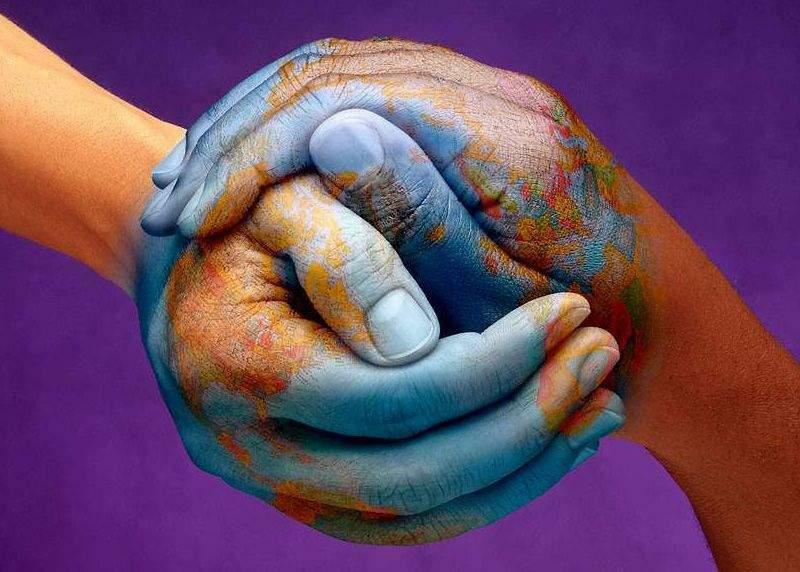 God, help us walk together in our journey here on earth. Amen. So many days these verses and prayers cut right to the center of what is on my mind and heart for that day. It can be a bit unnerving to think that others know what I need prayer for! But it happens so often. Today’s were no different, but I didn’t really give them too much thought until Julia Ann walked into the office. I asked her the name of her friend. The poor woman searched her brain and it came up empty. She was so embarrassed that this blankness came over her and she just couldn’t come up with it. We both laughed and she said, “Don’t tell her I forgot her name!” I said, “Don’t worry. I can’t tell her if I don’t know it either!” It was just so funny. She couldn’t think of the name of the class or the name of the friend or the friend’s husband and out of that came the most interesting conversation. In trying to come up with the name of the friend, she went through how they knew each other from years ago and then lost touch. Not too long ago their paths crossed again and they were talking about church which prompted the invitation. But then she went on to tell me about how her dad died when she was little and her mom worked all day, every day. She was of that generation when days off and five-day workweeks weren’t the norm. A teacher of hers would take her to Sunday school and teach her the bible stories we all know. She taught her about Jesus. She was given a bible with her name engraved on it. 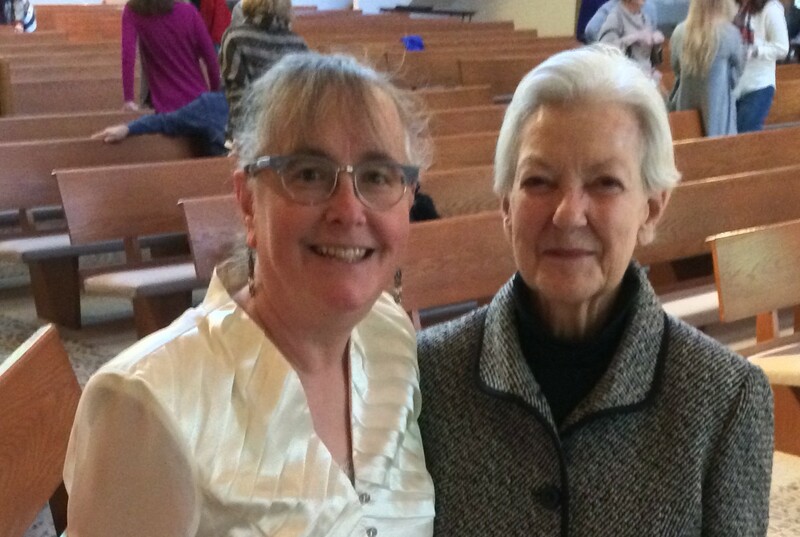 She raised her own children in the church and they were baptized. She was widowed about five years ago. It was a long conversation we had, about thirty minutes. And all the time she was so befuddled, trying to remember the name of her friend. She told me her name was Peg and I introduced myself, Julie. She said, “That’s my name too! Julia, but everyone calls me ‘Peg. '” I said my middle name was Ann with no “e” on the end, and she said hers too! It was just such a weird thing. And again, she kept trying to pull the name of her friend who had invited her to West Hills out of her brain, but it just wouldn’t come. She went on to tell me that after her husband died, she remembered that little bible she had received as a child and wondered where it had gone in all the moves of their life. As she was going through her husband’s things to give away to family or to donate to Goodwill, she discovered a small box in his desk. Inside the box were several small things, including her childhood bible. Her husband had an eye for the valuable, not just monetarily, but for the memories and meanings attached to things. She took this as a message from him to hold on to that word and its promises. Again, all this was very befuddled and hesitantly offered and she kept trying to remember the name of that friend. Oh Lord, you searched me and you knew me. You discern my thoughts from far away. God, help us walk together in our journey here on earth. I know it was Jesus. And her name was Julia Ann but people call her Peg. And in my grief over so much, he sees it, he knows it, he owns it. And he’s giving me a new heart.